Our main character is Yura Yamato (CV: Yura Yamato, as in Sakura from Tsubasa Chronicle), who’s ecstatic about enrolling at the Stella Woman’s Academy, in hopes of helping her with her social anxiety which has become a barrier when it comes to making friends. Maybe it’s because I feel like I can relate to her in this way, but Yura is already a much more interesting character than those in a good number of other series. Speaking of interesting characters, we have the members of the C3-bu who pride themselves in being freaks and weirdos. 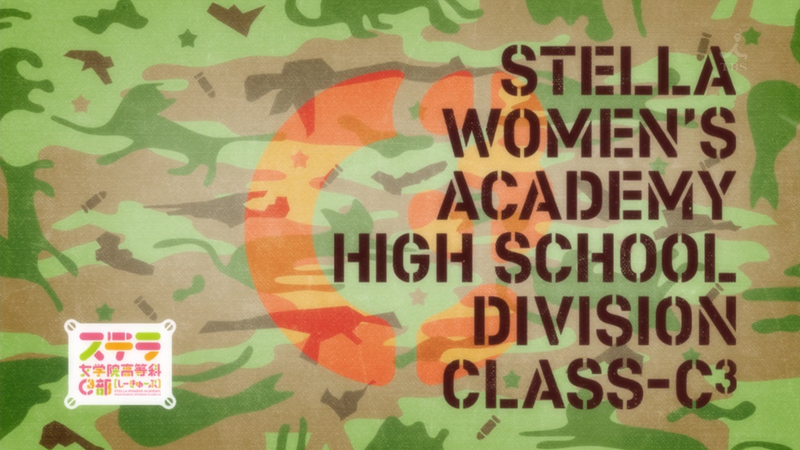 After all, I doubt the “proper” ladies of the academy would be interested in the war games that the club partake in. 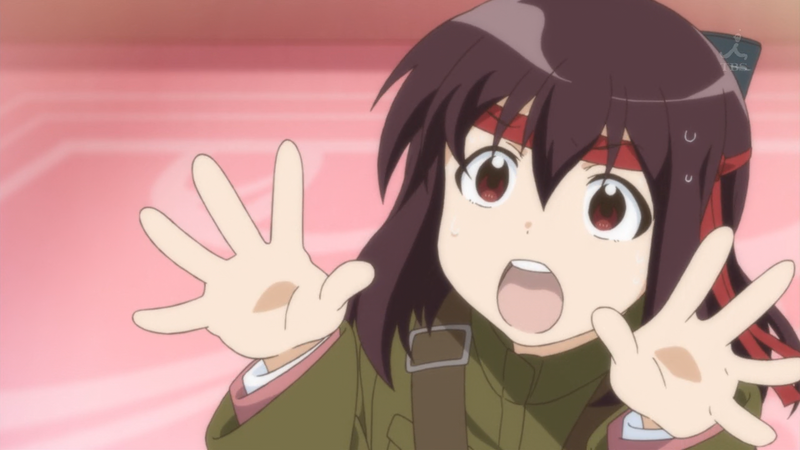 In this episode, we meet Karila Hatsuse (CV: Ai Kayano, as in Menma from Anohana), a girl who’s most likely of mixed heritage due to her blond hair/blue eyes and plays the Rambo during the war game. Then there’s Rento Kirishima (CV: Rima Nishizaki, a completely new seiyuu), who’s naturally very friendly and lures Yura into the club with cake. The other two members that we meet are the calm Mutsu Honoka (CV: Chiwa Saito, Senjougahara from Bakemonogatari) and the energetic Yachiyo Hinata (CV: Madoka Yonezawa, as in Ui from K–On!). I’m really excited to see more of the characters, as well as all the characters that the series has to offer. Judging from the OP, we’ll meet a lot more girls from other schools (a lot like Girls und Panzer). I was a bit curious about how Gainax would handle the animation for the series, and I was pleasantly surprised. The character designs are simple and offer a nice contrast to the detailed backgrounds where the airsoft battles take place. 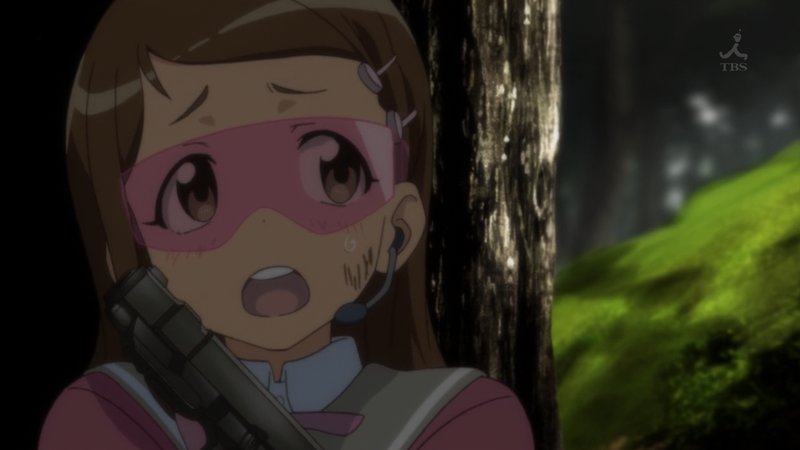 The music, particularly during the airsoft scenes, is great, varying from cool piano to lively big band. I’m really excited to see more from this series, especially more airsoft battles. Girls with guns has always appealed to me (maybe I might like girls in a position of power? But that might be tmi), and C3-bu is a great outlet for that oddly specific interest. Of course, this is definitely not a series for everyone. If you roll your eyes at the slightest mention of a series revolving around schoolgirls, then you’re probably better off passing on this. The rest of us will enjoy the hilarity and exciting action that C3-bu has to offer.